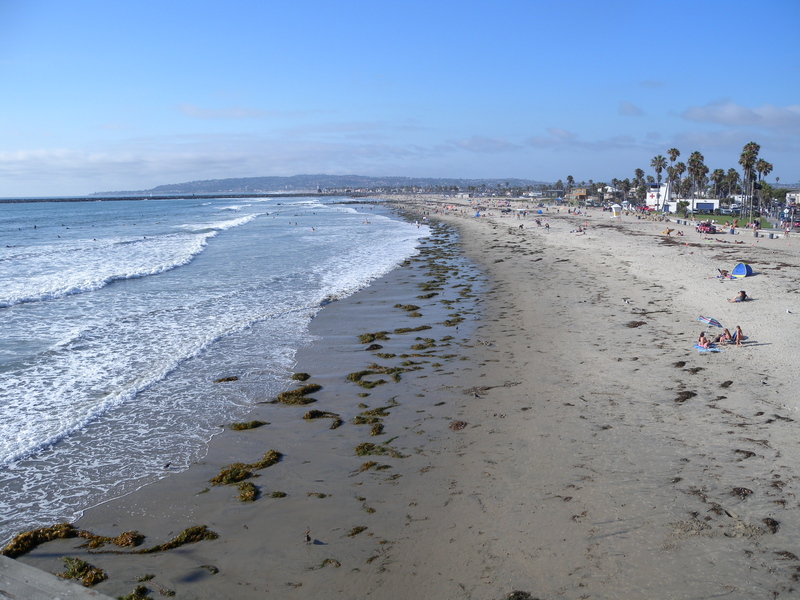 Welcome to Ocean Beach, at the coast of San Diego in the great California state. I tell myself this, often coming back after some annual business in San Diego. This is my end priority, after seeking out some fantastic yet cheap tacos. Visitors should be anxious to settle the many great beaches here. Choices are great, depending on your surf and sand desires. One is greater in surrounding youthful party energy (Mission Beach, further north), another is more upper crust (La Jolla, more further north). Ocean Beach is always my choice, the perfect balance between California’s more chillful beach culture and a small town vibe that doesn’t overwhelm in tourist behavior, yet still holds great entertainment value. Ocean Beach is that surfside place of simple joys. Here, a medium family-friendly community connects to a beach big enough to support appreciators of the Pacific Ocean soothing roar. OB has nothing to draw attention to itself to the abroad travelers flocking to popular beach elsewhere. Lacking are the visible souvenir shops, tacky tourist museum traps, carnival and stereo noise. Ocean Beach is the better escape. I get that sense just walking down the main Newport Ave. Within the surrounding area, I see little of the big name stores or snobby label fashion outlets. Fast food is pushed away with only one Starbucks (with a very aggressive no-public bathroom policy). More inviting, are some great thrift stores including the 2 Dollar Thrill, a store store chock full of DVDs, fun beach-themed clothes. Near to that was a five (or was it 3.99) dollar store with similar themes. Also, I found Galactic Comics, a collectibles and sequential art store with good geek treasure (hint: look up). Down the way, some tempting antique stores, especially the one with an army of tin robots in the window. Ocean Beach, much to love before the beach. The eats are plentiful and good on choice; with much local-owned or exclusive to San Diego. One personal favorite is the Lighthouse Ice Cream & Yogurt, where one could grab their amazing hot waffle and ice cream sandwich. Another fav is the South Beach Bar and Grill, where I found the best fish tacos ever. Also, the taste of fumes of the BBQ House on Newport Ave are hypnotic, heavenly, a must for carnivores. All this and more, very reasonably priced. However, the biggest star of Ocean Beach’s local food scene is Hodads, a bar and restaurant that claims the worlds greatest burger on their menu. I come here often questioning that, but always face a line down the block. I ask a few in my waiting attempts on the worthiness of Hodad’s great burgers. Heads nod, and replies imply its lengthy waits are rewarded. 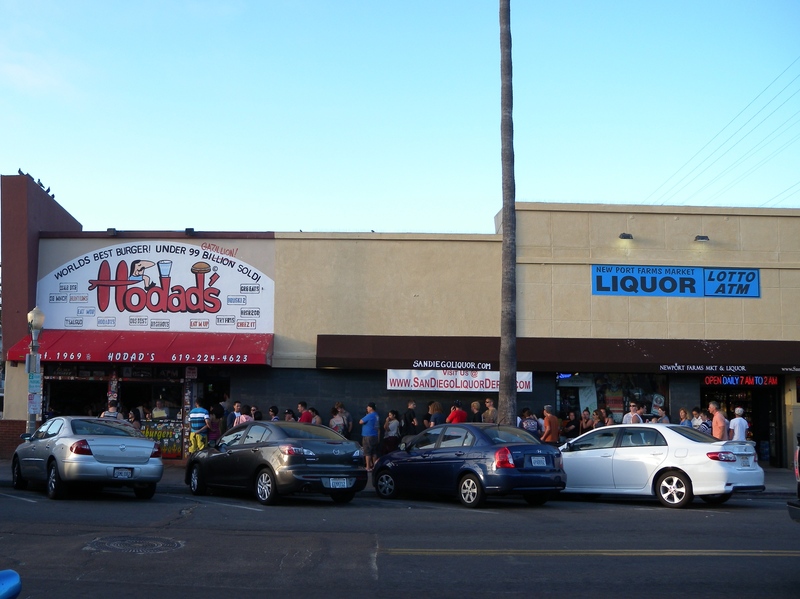 I always consider Hodad’s olate, full of tacos or ice cream. Next time.. 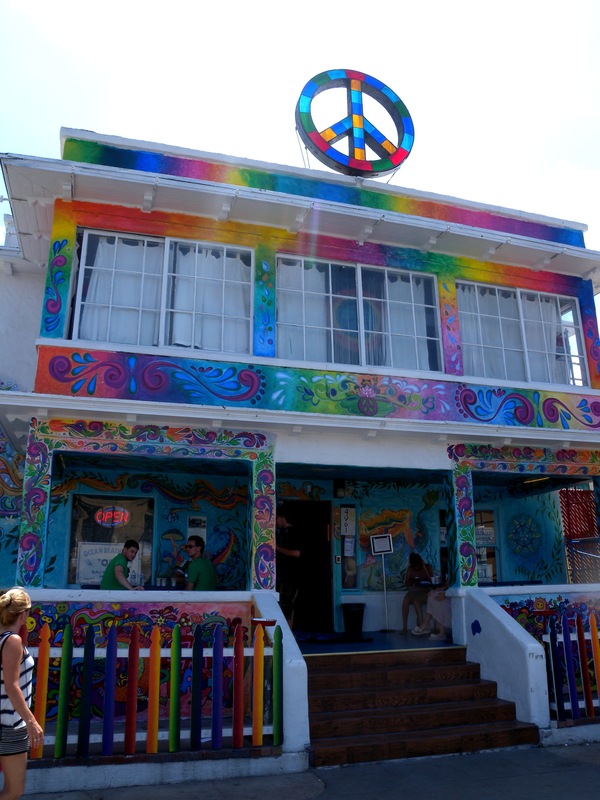 The most colorful building on Newport avenue is Ocean Beach’s International Hostel. Someday, I must go inside, perhaps even stay the night. Otherwise, there is another hostel of choice for me; the Point Loma Hostel, of which I personally recommend for visitors. That and this hostel, you will likely find a friend or few to further explore this wonderful area. 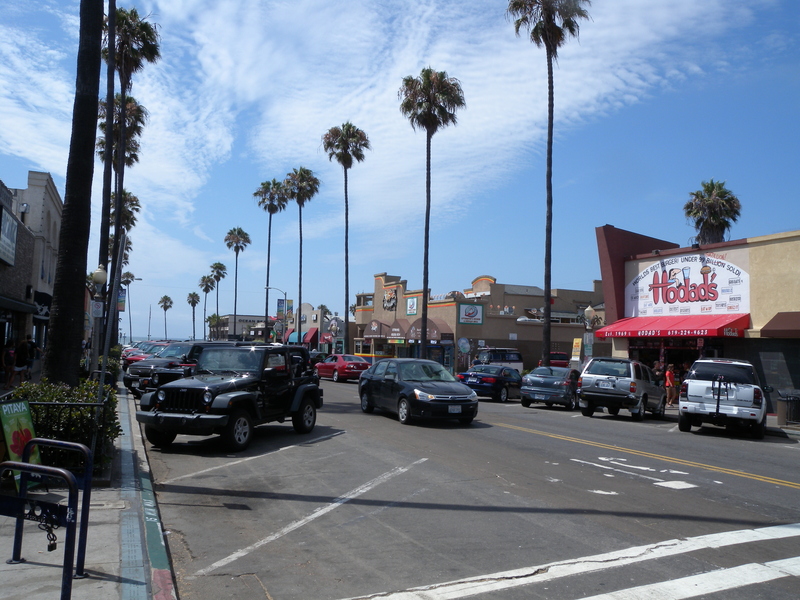 There is more to share about Ocean Beach, but must wait until next blogging time. Then, more time at the beach and a walk on the pier. Also, a some surfing and some moonlight later. Come back! 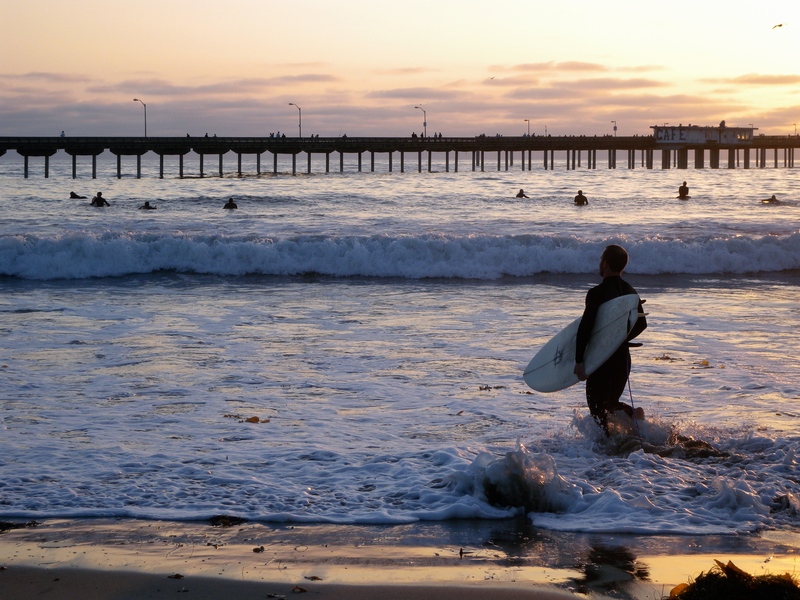 Posted on August 10, 2013 by Orion T.	This entry was posted in Travel and tagged adventure, beaches, California, Hodads, ocean beach, Pacific Coast, San Diego, surfing, travel, vacations. Bookmark the permalink.